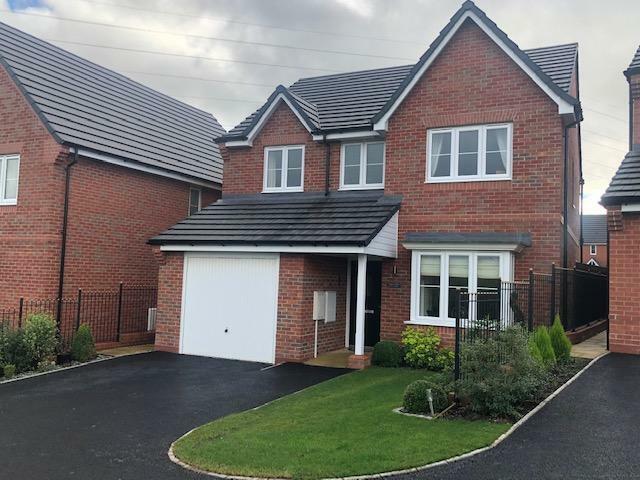 4 Bedroom Detached House For Sale in Stoke-on-Trent for Offers Over £250,000. This property is of showroom standard and has one of the most enviable cul-de-sac locations, overlooking open farmland with far reaching views of Mow Cop and beyond. This stunning detached home offers excellent living accommodation with a great size lounge taking in the wonderful open views, an amazing kitchen/diner that has been tastefully extended with a valuted ceiling and patio doors opening onto the lanscaped rear garden. To the first floor you will find a spacious family bathroom with a bath and a separate double width shower enclosure, four double bedrooms with the master benefitiing from an en-suite. The rear garden has been landscaped and enhanced by an indian stone patio area, shaped lawn area, vegetable patch, and a wonderful handmade summerhouse. There is also a garage and parking. One not to be missed!